In this tutorial you will learn how you can setup Hibernate Development Environment for developing and testing the Hibernate based application. Here in this section you will learn how to download and configure the Hibernate library files for developing the applications. The latest version of Hibernate comes with the all extra libraries necessary for developing the application. Since we are using the MySQL database for testing the application we will also have to download the JDBC driver for MySQL. If you are using other database you should download the JDBC driver for you database from the official website of your database server. 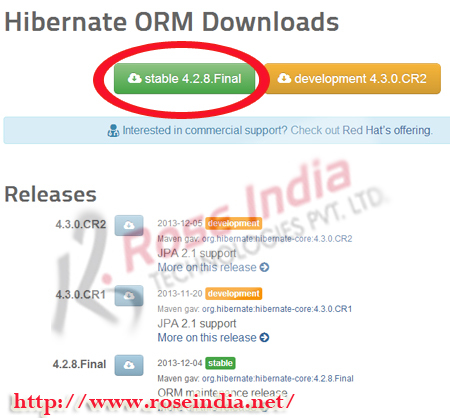 The latest version of Hibernate can be downloaded from it official website at http://hibernate.org/orm/downloads/. At the time of writing of the tutorial the final version of the Hibernate was Hibernate 4.2.8.Final. We have downloaded the file hibernate-release-4.2.8.Final.zip. It includes the libraries necessary to run the Hibernate based applications. Here you will find documentation, lib and project directories. Documentation directory contains the documentation and tutorials. The lib directory contains the library files and project directory contains many example projects. The lib directory contains the required folder which contains the required library of Hibernate. It contains other libraries also. Installing Hibernate is very easy process, you just have to unzip and then copy the library files from its lib directory. If you are using Eclipse, you have to copy the files into lib directory of your project. After copy the file in your project's lib directory, add the lib files in the class build path. Then on the right side select "Libraries" and then click on the "Add JARs" and then select the jar files from your project. This will make the jar files available in your project. In the next section we will learn about the Hibernate Configuration files used in the project.